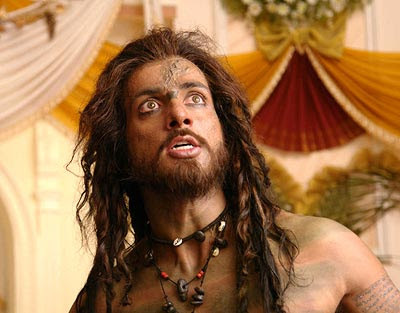 Sonu Sood, a familiar face in Hindi movies, has become a huge hit in the Telugu film industry. The tall and lean actor has had a good 2008 having done Hindi films like Jodhaa Akbar, Singh is Kinng and Ek Vivaah Aisa Bhi. He is also basking in the unprecedented success of the recently released Telugu film Arundhati, one of the runaway hits in the beginning of 2009. Sonu was brilliant as Pashupati and especially as aghora (he plays a tantric) he sent shivers down our spine. The unpretentious, friendly and warm actor talks about Arundhati, his role as Pashupati and acting in Telugu films. I was on the lookout for a new role. When I met the producer (Shyam Prasad Reddy) and director (Kodi Ramakrishna), the role was that of a bouncer. They wanted me to play an aghora and I did not know who an aghora was. The producer and director then showed me some sketches. The only thing I knew was that I would be working with a team which had done its homework. I signed the role purely on instinct. Besides the script, weren't you influenced by big names like Shyam Prasad Reddy and Kodi Ramakrishna? The script was the main reason to sign the film. The names were also important. You've put in a high-voltage performance as Pashupati. Did you do any homework for it? I saw photographs of aghoras given to me by the production unit. I didn't get much reading material on them, though. I was a bit confused on whether to underplay or overplay but the director knew what he wanted. In the end it was spontaneity on the sets. A role on reincarnation, a tormented spirit wreaking vengeance -- did you think that such a role would work in today's age of science and rationality? Yes, I did have some hesitation. I did have this question in my mind on how to convince people with the supernatural element. All the people who worked on the script were fully charged and they had the conviction that they could do it. So I believed in that conviction and the supernatural theme connected with the audience. How challenging was it to play the character? It was not easy. My make-up alone took 4-5 hours and it was tedious maintaining it too. In fact it was a challenge. At times we used to shoot continuously for many hours without a wink. Physically it was tiring. And I used to have rashes on the body because of the make-up. I suffered from backache as well. All this made me think of never doing something like this again. However after seeing the success of Arundhati, I have to rethink my decision. I did Jodhaa Akbar and Arundhati simultaneously. And both the characters were totally different. When I returned to Jaipur (for Jodhaa Akbar) after shooting for Arundhati, I would tell Ashutosh Gowarikar (director Jodhaa Akbar) and his team about playing the aghora. I think it's some supernatural force which helped me do it. You were able to induce fear and terror. Your body language and expressions were so apt especially in the scenes as aghora. How did you manage that? I even scared myself when I watched the film in the theatre! I think the word 'action' did the trick. I think it's destiny which made me play Pashupati in the film. My sister who would come to the sets to watch the shoot told me, 'I couldn't see you bhaiyya; I could see only the character.' In fact the character was so overpowering and strong that I couldn't see anything else. Did the character haunt you later? Were you able to shed it easily from your mind and body? It wasn't easy. The character stayed with me for quite some time. Arundhati is faring very well. Did you anticipate its success? I believed in the film and knew it would be appreciated. But what I didn't realise was that it would break records. It's been a great learning experience. It has also proved that if you believe in yourself, you can do wonders and create history. You have been playing the baddie (Ashok) as well as essaying some good roles (Super, Athadu, Mr Medhavi). What challenges you as an artiste? Does playing roles with shades of grey give you more scope as an artiste? I never wanted to be typecasted. That's why I do different roles. Every role is challenging. It is important for an actor to explore all phases and to learn. How did you adapt yourself to Tamil and Telugu films? What about the language barrier? When I started doing these films, there was no choice. I was an engineer who got into acting and the scripts were good. The technicians in the South were brilliant. I learnt the words, then the lines -- the whole process. It was like a new classroom with new teachers. The technicalities I learnt in the Tamil and Telugu film industries helped me in the Hindi film industry later on. Are you working on any Telugu projects? I have done a movie (Bangaru Babu) with Jagapathi Babu where I play a positive role. I am listening to scripts though I haven't signed any films yet. Will you juggle Hindi and Telugu/Tamil films? I will juggle between Hindi and Telugu films. I enjoy working in the Telugu film industry. I plan to work in two Telugu releases in a year. How selective are you in choosing scripts? People say I'm choosy but the role has to excite me. It has to be a character which makes me get up without an alarm. Can we know something about Sonu, the man in real life...? Well I am from a small town Moga (Punjab). I never thought I would get into acting. Thanks to my family's support, I am where I am today in the film world. I am a shy person, I don't party. I play the guitar, watch movies, play with my six-year old son, spend time with my family and also play cricket.